BN-5S Width: 48-96", Color: Silver Features: -Strong lightweight aluminum alloy construction. Product Type: -Banner Stands. Country of Manufacture: -United States. Dimensions: -Hem banner for 1-1/8'' dia, crossbar, top and bottom. -0.75" - 1'' tube diameter. -Two 3'' x 16'' formed steel bases. Width 30-48" - Overall Height - Top to Bottom: -48". Width 30-48" - Overall Width - Side to Side: -30". Width 48-96" - Overall Height - Top to Bottom: -96". Width 48-96" - Overall Width - Side to Side: -48". 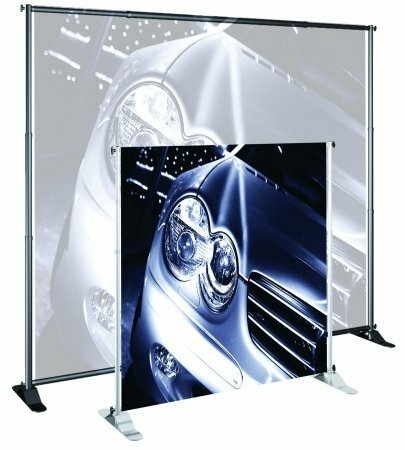 Jumbo Banner Stand Classic (for Large Format Graphics) Color: Silver, Width: 30-48"